JOE Goldberg, sometimes referred in Camden as ‘Haringey’s Theo Blackwell’ whatever that might mean, explains on the Labour List site today what Catherine West those interested must do to stand for Labour in the Hornsey and Wood Green constituency. This, we don’t need to say too many more times, is a key Labour attack point as they try and take down Lynne Featherstone at the next general election. Well, they have sorted out their AWS now and soon a candidate will be confirmed. A full blown battle will commence. In truth, rather than reveal too many tactics, Joe’s ‘memo’ seems more of a list of things he hates about Lynne Featherstone which you’ve probably digested in other forms before and by the end my mind was drifting… That’s not necessarily his fault, it’s just whenever I hear or read about Joe I can’t help being distracted. 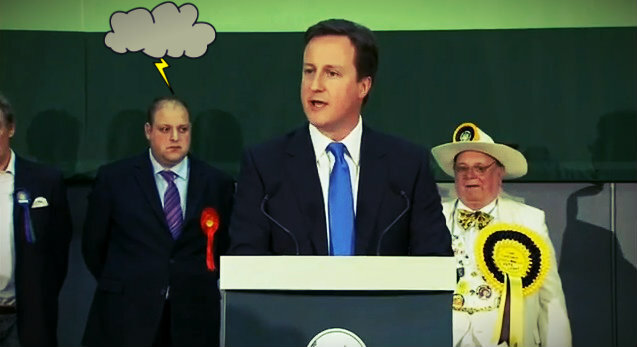 I can’t help thinking of his big TV moment behind David Cameron at the last election. The paper candidate in the PM’s Witney constituency, he had the job of looking disgruntled for Labour as Cameron, having held his seat, talked about the nation rejecting Gordon Brown’s Labour. And doesn’t he do disgruntled well? Better disgruntlement than any fudged-off Oscar nominee with a camera up their nose after missing out on an academy award to Tom Hanks. You can still see the clip on You-Tube. There’s plenty of defiant head shaking, glazed looks and evils into the back of Cameron’s head, the kind of furious stare he might give if the Tory bossman was standing on the left side of an escalator making everybody late. People in north London forgot to listen to what the soon to be Prime Minister was saying that night. Instead, they simply shouted at their tellies: ‘Look there’s Joe Goldberg. Look how pissed off he looks… Wow, he looks pissed off. He’s pissed off.’ Expect the same angry faces in the background if Labour fail on their Mission BinLynne. Come the campaign, it will be one of London’s most interesting showdowns.